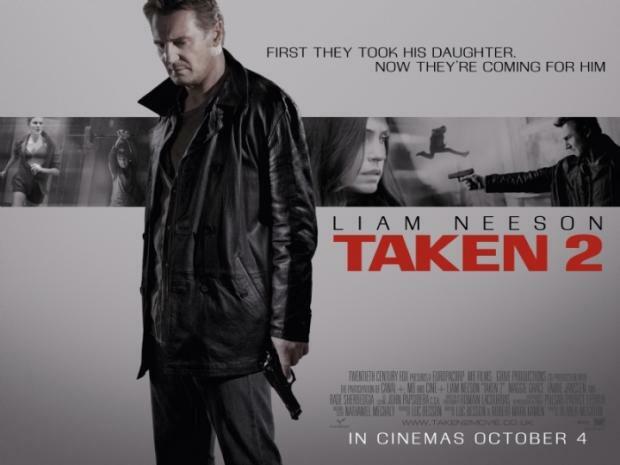 It would be difficult for TAKEN 2 to top 2008’s “Taken” and I think it’s a smart move on the part of all concerned that they don’t even try. Let’s take the “Die Hard” movies for an example. Each “Die Hard” is more expensive and bigger than the one before it, coming up with even more fantastic action sequences until we wind up with Bruce Willis outrunning a F-35 Lightning II fighter jet. But TAKEN 2 stays at the same level of the first movie and because it remains at that level we get action scenes that actually seem plausible. 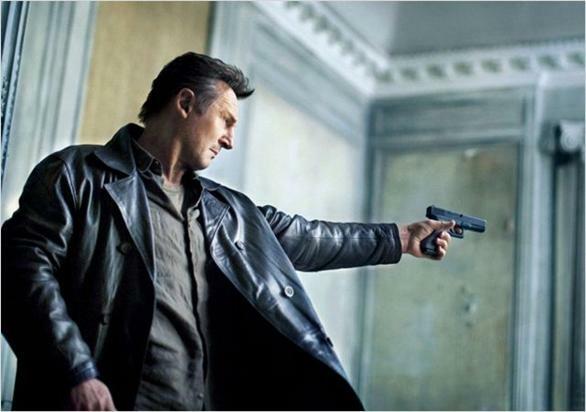 Liam Neeson, as in the first one is such a terrific action hero because he actually can act and so projects not only toughness but intelligence as well. We pick up on Bryan Mills (Liam Neeson) back in L.A. helping his daughter Kim (Maggie Grace) learn how to drive and comforting his ex-wife Lenore (Famke Janssen) who is going through changes with her current husband. The husband cancels a family trip to China and Bryan offers to holiday with Lenore and Kim in Istanbul (not Constantinople) after he finishes up a job there. They take him up on his generous offer. Also in Istanbul (not Constantinople) is Murad Krasniqi (Rade Serbedzija) the father of one of the men Bryan killed during the events of the first movie. He hasn’t come alone. He’s got a lot of help. A whole lot. And their intention is simple: kidnap Bryan and take him back to their hometown in Albania so that the families of the men he killed can watch him die. It’s a bonus that Kim and Lenore are there as Murad has plans in mind for them as well. Pretty soon it’s Bryan and Lenore who have been taken and have to rely on Kim to rescue them. Now, don’t worry…Kim doesn’t pick up a pair of guns and start blazing away at the bad guys. But she does play a pivotal part in helping her dad get away from the bad guys in what I thought was a pretty ingenious sequence. And she does get to take part in a car chase that I thought was as funny as it was thrilling since it played out as a screwed up version of an earlier driving lesson Bryan and Kim had before everything went to hell. And as in the first one, Liam Neeson is solidly at the center. Even though I didn’t enjoy this as much as “Taken” I liked it a lot more than “Unknown.” But you know what? I’d be perfectly happy seeing Liam Neeson doing these European based thrillers for Luc Besson and young hungry directors every two or three years because they’re so dependably entertaining. They’re pulpy action adventures with just enough characterization so that we care about the people on the screen but not so much that it gets in the way of the punchy punchy run run. That’s not to say the movie is perfect. The bit with the world’s smallest cell phone had me rolling my eyes and the hyper quick editing during the fight scenes made me groan. Especially since it looked like Liam Neeson was pulling off some pretty good moves there. The two editors on this movie get no points from me. And as the leader of the Albanian kidnappers Rade Serbedzija isn’t much of a fearsome evil criminal mastermind. It apparently doesn’t matter to him in the least that his son kidnapped and tortured underage girl, hooking them on drugs and selling them to pervy old men. All he cares about is that his son was killed and he wants revenge. Famke Janssen does solid supporting work here as does Maggie Grace. 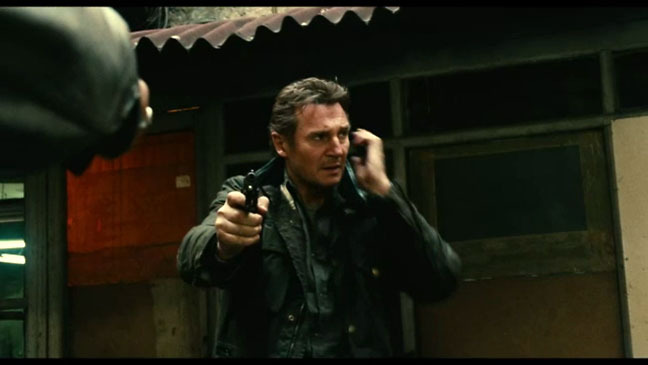 TAKEN 2 isn’t as surprising or on the same blow-your-mind level as “Taken.” And it doesn’t have a badass speech like the now classic “I don’t know who you are” and you know something? I’m glad the writers didn’t even try. TAKEN 2 is a cheeseburger-and-fries action thriller as professionally efficient in its storytelling as Bryan Mills is at looking for, finding and killing bad guys.